Zirui Song, PhD; John Z. Ayanian, MD, MPP; Jacob Wallace, BA; et al. Song and colleagues analyze the effect of the January 2010 cut in Medicare consultation payments. See editorial by O’Malley. Antonio Ivan Lazzarino, MD, MSc, FFPH; Mark Hamer, PhD; Emmanuel Stamatakis, PhD; et al. Lazzarino et al test whether low socioeconomic status amplifies psychological stress as a risk factor for all-cause mortality. An invited commentary by Wells and Miranda discusses the negative influence of job loss on health. Differential Mortality for Persons With Psychological Distress and Low Socioeconomic Status: What Does It Mean and What Can Be Done? Lin Y. Chen, MD, MS; Nona Sotoodehnia, MD, MPH; Petra Bůžková, PhD; et al. Chen et al review data from 2 large population-based studies to determine whether atrial fibrillation (AF) is associated with an increased risk of sudden cardiac death in the general population. See the invited commentary by Reiner and Chugh. Stephen F. Derose, MD, MS; Kelley Green, RN, PhD; Elizabeth Marrett, MPH; et al. Derose and coauthors performed a randomized controlled trial to evaluate an automated system to decrease primary nonadherence to statins for lowering cholesterol. See also the invited commentary by Fischer. George Howard, DrPH; Daniel T. Lackland, DrPH; Dawn O. Kleindorfer, MD; et al. Howard et al address the possibility that an elevated systolic blood pressure level is associated with a greater increase in stroke risk in blacks than in whites, with particular emphasis on relatively young adults (age 45-65 years). See article by Adams et al and invited commentary by Kim and Johnston. Is Hypertension the Key to Reaching the Healthy People 2000 Goals by 2020? Alyce S. Adams, PhD; Connie Uratsu, RN; Wendy Dyer, MS; et al. Adams et al evaluated patients with newly initiated antihypertensive treatment to identify potential health system solutions to suboptimal adherence and persistence. See the article by Howard et al. Dimitri M. Drekonja, MD, MS; Thomas S. Rector, PhD; Andrea Cutting, MA; et al. Drekonja et al used VA administrative data from 2009 to study male UTI treatment and outcomes. Episodes were identified by combining ICD-9 codes with UTI-relevant antimicrobial prescriptions. Drug name, treatment duration, and outcomes were recorded for index cases. See invited commentary by Trautner and research letter by Drekonja. 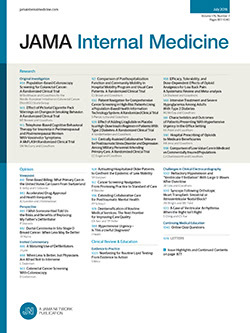 Ateev Mehrotra, MD; Suzanne Paone, DHA; G. Daniel Martich, MD; et al. Robert J. Blendon, ScD; John M. Benson, MA; Michael D. Botta, AB; et al. Aditi Nerurkar, MD, MPH; Asaf Bitton, MD, MPH; Roger B. Davis, ScD; et al. Are Bisphosphonates Associated With an Increased Risk of Atypical Femoral Fractures as a Class?